Simulator of Common Thermocouples and RTD Sensors: Outputs a signal equivalent to signals of ten types of thermocouple K, E, J, T, N, S, B, L, M and R as well as Pt100 esistance temperature detector.Suitable for a broad range of applications such as maintenance of industrial process instruments and various thermometers. Multi-range Thermometer: Can be used as a multi-range thermometer. Three-wire RTD connection for an RTD is possible. Built-in Sensor for Reference Junction Compensation: Reference junction compensation when generating a thermocouple signal can be performed by the built-in temperature sensor. For more precise compensation, use the external RJC sensor (model B9108WA, sold separately). Shift Key: Selects temperature” or RTD” unit. Terminal Adapter: Provides screw terminals for connecting a temperature sensor such as a thermocouple and RTD when measuring temperature. When generating an RTD signal, a three-wire RTD signal can be output using the lead cables that come with the CA12E by short-circuiting the Lo-Lo terminals using the short-circuit bar that also comes with the CA12E. Plug for External RJC Sensor: The RJC sensor is sold separately. Choose either "rubber boot" or "carrying case"
The roomy case easily holds the calibrator without having to disconnect the lead cables. Power is turned off automatically if the calibrator is not touched for 10 minutes, prolonging battery life. The handy calibrators can run on the built-in 1.5-V ANSI batteries or an AC power supply using the AC adapter (sold separately). The slightly longer than usual lead cables of 1.7 m (approximately 0.1 Ω for both cables) allow easy cable connection even if the handy calibrator is put on the floor. Almost the same size and weight as a hand-held digital multimeter, this calibrator is designed for use in the field. 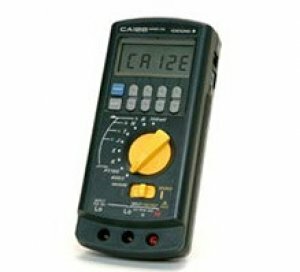 For the CA11E and CA12E, There is performing calibrations during periodic maintenance as they can be simply calibrated by the up/down keys. The complete protector protects the circuit against short-circuiting of the voltage output terminals and application of a voltage (of up to 30 V) to the output terminals, etc. due to misconnection.